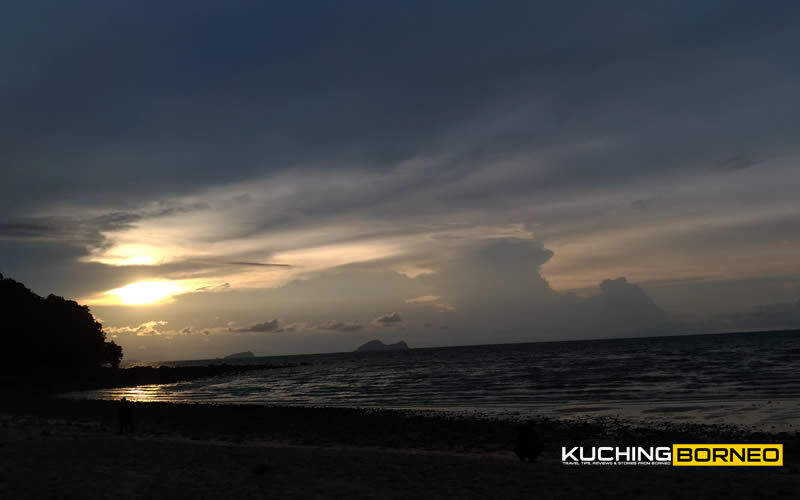 Last weekend, I had a short family trip to Damai Beach Resort, which is one of Kuching’s most prominent seaside resorts. 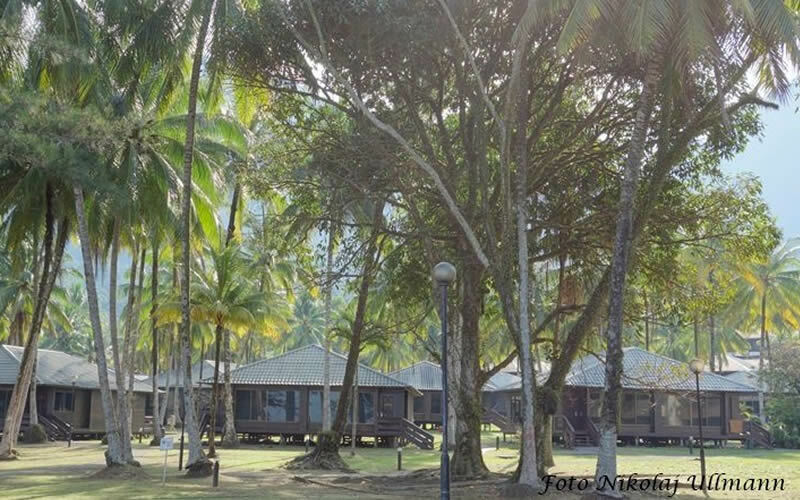 I have passed by Damai Beach Resort countless times when I do go to Camp Permai, Damai Central and the Sarawak Cultural Village, but this was going to be my first stay here. 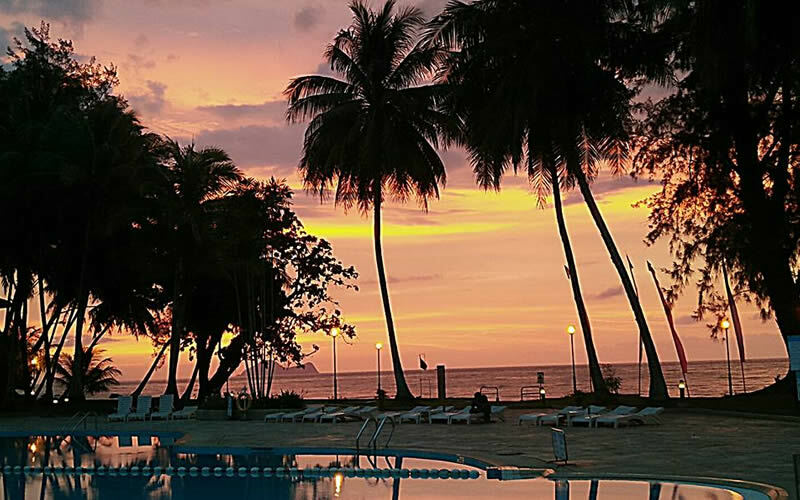 As an outsider, Damai Beach Resort looked really majestic. Hotel rooms were placed high on hill tops as if its fighting for prominence among the thick trees that surround it, while chalets they had looked cozy near the lovely pools the resort owned. Around the hotel lobby, unique Sarawak featured decorations made sure I knew it was a hotel and resort in Sarawak, so I was very much excited to have my first stay in this iconic place. Upon arrival, I noticed the place was packed and the staff were doing their best to accommodate the massive influx of guest. I was told that there was several activities happening that weekend, and that the hotel was almost at its peak capacity. Some guest who were supposed to have check-out hadn’t and this caused us to be seated at one of the cafes to wait for the room to be ready. At some point, the whole lobby felt like an airport lounge because there was so many people, but I was told this was just an one of those days everything was happening. Despite the hive of activities, the staff kept their cool and seemed to entertain everyone with a smile, so that was good. When I finally got my room keys, it was almost 3PM, which meant there was a one hour delay for my check-in. Like I said, it was a busy day, and the free flow of iced-lemon drink did its part well to cool off any impatience I had, though if the wait took another hour or more, I will likely start getting agitated. Anyway, with the room keys in my hand, I grabbed my bags and started to walk towards my room which was located just nearby the pools. A bell boy came over almost immediately to offer help, which I was more than please to indulge. The bell boy was polite, but he spoke little, perhaps a bit shy, but his gesture in coming to my aide without me asking was commendable. When I reached my room, the first thing I thought was how huge the room was. The bathroom had a tub, and it was also equally massive. Being nearby the swimming pool, the room overlooked the pool, so that was good though I must admit I wished there was a balcony to sit on as I watched activities on the pool. Aside from that, the room I had also came with a large flat screen TV, a dressing table, not less than 3 power points for use, multiple drawers, an iron and iron board, a minibar, and several stand lamps. There was also nice tribal decors here an there making the whole room look really neat despite the fact it does look and feel a bit aged, hence proving a point made to me earlier by a friend that the resort had not seen any major refurbishments since it opened in the 80’s. Either way, for a hotel this old, the hotel does looks pretty good and the rooms were clean and nice, though a bit dated in style. My only complaint however would come in the king size bed I had which was obviously old, worn out, and rather hard. 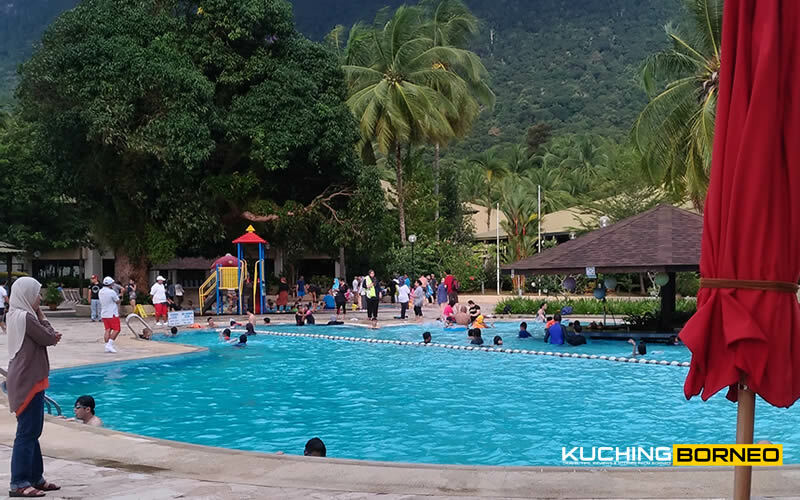 Since I was here for a function, I did not get to enjoy much of the facilities and entertainment during the night, and my late check-in also caused me to have little time to enjoy what Damai Beach Resort had to offer. 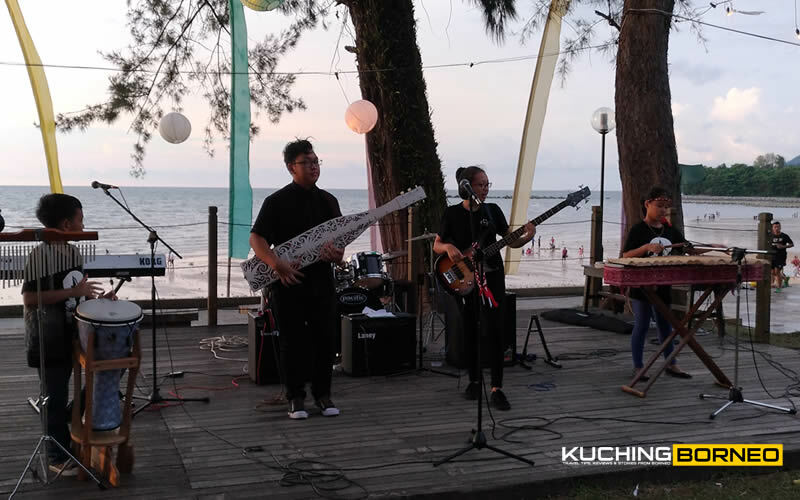 However, around 4PM-ish, this tribal fusion music band called Pinanak started to play live on a small stage near the pool and I thought they were amazing. Since it was a busy weekend, the beach was buzzing with activities, and the pools had a good number of guest as well. I had a short dip in the pool, and left for my room to prepare for the night function I had to attend. Anyway, for what’s it worth, the pool was really good, especially since they had a dedicated section for kids as well. Truth to be told, I didn’t had the chance to tryout the breakfast buffet because I woke up late and had to hurry back home for some obligations. 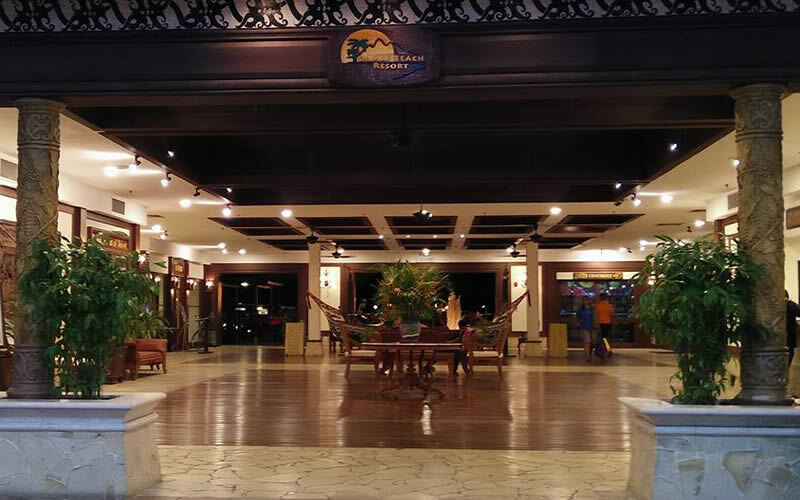 However, our dinner buffet that night was catered by the hotel and I’d like to think that as the indication of the food quality Damai Beach Resort served. The menu was known as the Barbecue Buffet, and we had lamb, chicken, beef, fish, and prawns for barbecue while the ready meals included fried bihun, aglio olio, white rice and fruits on the sides. Anyway, as subjective as taste is concerned, the barbecue was delicious with the lamb a particular highlight. Also well worth noted was the Aglio olio which wasn’t too spicy and just right. Damai Beach Resort I believe is still one of the better well maintained beach resorts in Kuching, and the fact this resort does still looks very lively and nice, despite not seeing a major renovation since its opening, is testament to how it is well maintained- at least the parts I did see. 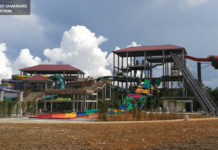 A major renovation is said to be coming to the resort soon, and thereafter, the resort would be under a new management as I was made to understand, hence likely making it even better than it currently is. Anyway, irregardless, Damai Beach Resort for now it is still a great place to relax and enjoy the seaside and pool in Kuching, with cheap and affordable rates available all year round at HotelsCombined.com, just in case you are planning to stay here anytime soon. p/s: It was a busy day for me when I was at Damai that day, so I forgot to snap photos, hence the use of stock or Damai Beach Resort photos.